As the 20th began, Pennsylvania's lumber era was at its peak. Each year near the 4th of July, the numerous woodhicks and lumber camp workers would gather together in celebration after another year's hard work. Song, dance, good food and lively contests would highlight these festive get-togethers. In memory of those bygone years and in celebration of our past heritage, The Pennsylvania Lumber Museum, The Pennsylvania Lumber Museum Associates and the Pennsylvania Historical and Museum Commission have re-created those celebrations called "conventions." 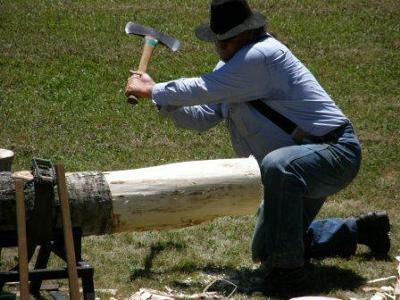 Join us on the grounds of the Pennsylvania Lumber Museum in Galeton and become a part of the lumbering era. Attendees at the Barkpeelers Convention can experience the rugged lifestyle of the woodhicks in the recreated logging camp, watch the sawmill turn logs into lumber, enjoy the old time sounds of the Sadie Green Sales Band, and participate in the games and festivities enjoyed by woodhicks at the turn of the century during the heyday of the lumber boom, including greased pole, log rolling, birling and cross cut saw competitions, as well as frog jumping competitions for children. Handcrafted products will be sold. Entertainment provided by Rich Pawling's History Alive! For more information, visit http://lumbermuseum.org. Thank you for all the information on attending the 38th Annual Barkpeelers Convention in July, 2012. This event sounds like a lot of fun to attend.